An Upland Life contributor was an official gun at this event, and thus didn't have much time to take action shots (well, only with a shotgun). In between senior and master braces, though, a few handsome dogs were kind enough to do some glamour poses. A handsome Weimararner waits for his bracemate in the morning sun, and watches the master bird field's planters go to work. The big male Weim turns his head towards the gallery (and the bird box). A German Wirehaired Pointer has a chukar partridge on his mind. Sam the wirehair keeps an eye on the bird planters. A wirehair considers the camera (and the photographer). A German Shorthaired Pointer, waiting in the hunt test field gallery, catches a bit of scent from the bird field. 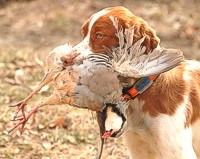 A Brittany's intensity builds while she waits to run as 'by' dog in a senior brace. 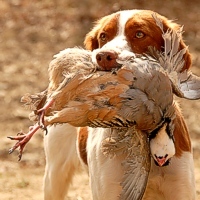 Tootsie the Brittany eyeballs her handler while patiently holding her retrieved chukar partridge. A Brittany waits for the 'out' command before giving up her prize.